Update April 27: Notice was received today that this submission has gone to the Panel. I did a study of 2013 records from the CRN top rated US surface stations. It was published Aug. 20, 2014 at No Tricks Zone. Most remarkable about these records is the extensive local climate diversity that appears when station sites are relatively free of urban heat sources. 35% (8 of 23) of the stations reported cooling over the century. Indeed, if we remove the 8 warmest records, the average rate flips from +0.16°C to -0.14°C. In order to respect the intrinsic quality of temperatures, I calculated monthly slopes for each station, and averaged them for station trends. Recently I updated that study with 2014 data and compared adjusted to unadjusted records. The analysis shows the effect of GHCN adjustments on each of the 23 stations in the sample. The average station was warmed by +0.58 C/Century, from +.18 to +.76, comparing adjusted to unadjusted records. 19 station records were warmed, 6 of them by more than +1 C/century. 4 stations were cooled, most of the total cooling coming at one station, Tallahassee. So for this set of stations, the chance of adjustments producing warming is 19/23 or 83%. A study of US CRN1 stations, top-rated for their siting quality, shows that GHCN adjusted data produces warming trends several times larger than unadjusted data. The adjusted files are another story. Typically, years of data are deleted, often several years in a row. Entire rows are erased including the year identifier, so finding the missing years is a tedious manual process looking for gaps in the sequence of years. All stations except one lost years of data through adjustments, often in recent years. At one station, four years of data from 2007 to 2010 were deleted; in another case, 5 years of data from 2002 to 2006 went missing. Strikingly, 9 stations that show no 2014 data in the adjusted file have fully reported 2014 in the unadjusted file. It is instructive to see the effect of adjustments upon individual stations. A prime example is 350412 Baker City, Oregon. Over 125 years GHCN v.3 unadjusted shows a trend of -0.0051 C/century. The adjusted data shows +1.48C/century. How does the difference arise? The coverage is about the same, though 7 years of data are dropped in the adjusted file. However, the values are systematically lowered in the adjusted version: Average annual temperature is +6C +/-2C for the adjusted file; +9.4C +/-1.7C unadjusted. How then is a warming trend produced? In the distant past, prior to 1911, adjusted temperatures decade by decade are cooler by more than -2C each month. That adjustment changes to -1.8C 1912-1935, then changes to -2.2 for 1936 to 1943. The rate ranges from -1.2 to -1.5C 1944-1988, then changes to -1C. From 2002 onward, adjusted values are more than 1C higher than the unadjusted record. Some apologists for the adjustments have stated that cooling is done as much as warming. 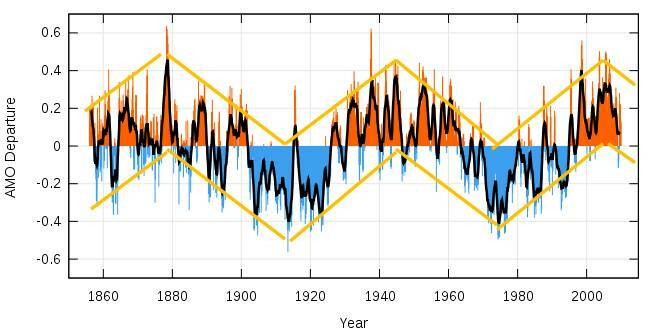 Here it is demonstrated that by cooling selectively in the past, a warming trend can be created, even though the adjusted record ends up cooler on average over the 20th Century. A different kind of example is provided by 417945 San Antonio, Texas. Here the unadjusted record had a complete 100% coverage, and the adjustments deleted 262 months of data, reducing the coverage to 83%. In addition, the past was cooled, adjustments ranging from -1.2C per month in 1885 gradually coming to -0.2C by 1970. These cooling adjustments were minor, only reducing the average annual temperature by 0.16C. Temperatures since 1997 were increased by about 0.5C each year. Due to deleted years of data along with recent increases, San Antonio went from an unadjusted trend of +0.30C/century to an adjusted trend of +0.92C/century, tripling the warming at that location. These stations are sited away from urban heat sources, and the unadjusted records reveal a diversity of local climates, as shown by the deviation and contrasting Max and Min results. Seven stations showed negative trends over their lifetimes through 2014. Adjusted data reduces the diversity and shifts the results toward warming. The average trend is 4 times warmer, only 2 stations show any cooling, and at smaller rates. Many stations had warming rates increased by multiples from the unadjusted rates. Whereas 4 months had negative trends in the unadjusted dataset, no months show cooling after adjustments. Looking at periodic trends within the series, it is clear that adjustments at these stations increased the trend over the last 100 years from flat to +0.68 C/Century. This was achieved by reducing the cooling mid-century and accelerating the warming prior to 1998. As it happens, the stations are spread out across the continental US (CONUS): NW: Oregon, North Dakota, Montana; SW: California, Nevada, Colorado, Texas; MW: Indiana, Missouri, Arkansas, Louisiana; NE: New York, Rhode Island, Pennsylvania; SE: Georgia, Alabama, Mississippi, Florida. The method involves creating for each station a spreadsheet with monthly average temperatures imported into a 2D array, a row for each year, a column for each month. The sheet calculates a trend for each month for all of the years recorded at that station. Then the monthly trends are averaged together for a lifetime trend for that station. To be comparable to others, the station trend is presented as degrees per 100 years. A summary sheet collects all the trends from all the sheets to provide trend analysis for the set of stations and the geographical area of interest. Thus the temperatures themselves are not compared, but rather the change derivative expressed as a slope. I have built Excel workbooks to do this analysis, and have attached two workbooks: USHCN1 Adjusted and Unadjusted. These 23 US stations comprise a random sample for studying the effects of adjustments upon historical records. Included are all USHCN stations inspected by surfacestations.org that, in their judgment, met the CRN standard for #1 rating. The sample was formed on a physical criterion, siting quality, independent of the content of the temperature records. The only bias in the selection is the expectation that the measured temperatures should be uncontaminated by urban heat sources. It is startling to see how distorted and degraded are the adjusted records compared to the records submitted by weather authorities. No theory is offered here as to how or why this has happened, only to disclose the records themselves and make the comparisons. In conclusion, it is not only a matter of concern that individual station histories are altered by adjustments. But also the adjusted dataset is the one used as input into programs computing global anomalies and averages. This much diminished dataset does not inspire confidence in the temperature reconstruction products built upon it. Thank you for undertaking this project. Hopefully my analyses are useful in your work. 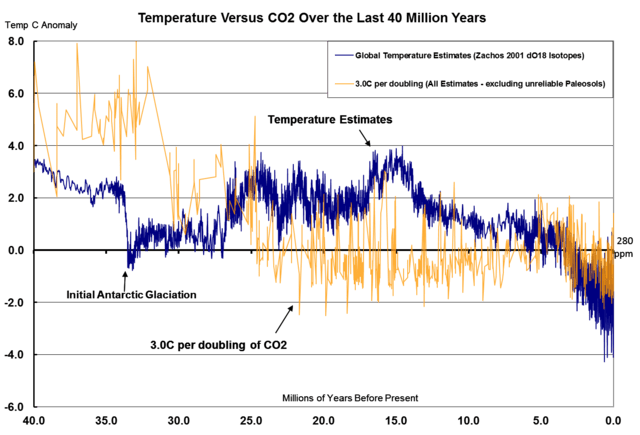 On Climate Theories–Response to David A. So everyone is theorizing and wondering if and when the best theory will win–that is, become the new conventional wisdom. According to Christy, the science is far from settled, and he has examined the datasets extensively, having built some of them himself. “It would be slightly more accurate to say that the lapse rate is the vertical temperature gradient at which convection switches off and therefore stops cooling the surface. The sun warms the surface, but the heat escapes very quickly by convection so the build-up of heat near the surface is limited. In an incompressible atmosphere, it would *all* escape, and you’d get no surface warming. But because air is compressible, and because gases warm up when they’re compressed and cool down when allowed to expand, air circulating vertically by convection will warm and cool at a certain rate due to the changing atmospheric pressure. Air cools as it rises and expands, and warms as it descends and is compressed. This warming/cooling effect means that hot air no longer rises when it would cool faster from expansion than the surrounding air. Cold air can sit on top of warm air and be stable. The adiabatic lapse rate is why the tops of mountains are colder than their bottoms. It’s a bit like the way a pot of boiling water sticks at a temperature of 100 C. If you turn the gas up, the water boils more vigorously, carrying more energy off as steam, which balances the extra energy supplied and keeps the temperature still at exactly 100 C. The rate at which heat escapes is very non-linear – extremely fast for temperatures above the threshold, extremely slow for temperatures below it. So long as the system is driven hard enough, it will get driven up against the non-linear limit and held there. The lapse rate does the same thing, except that instead of fixing the temperature, it fixes its gradient so you get a rigid slope that can freely float up and down in level. The temperature at the average altitude of emission to space converges on the temperature that radiates the same energy the Earth absorbs. All levels above and below it are held in a fixed relationship to it by the lapse rate. The temperature at any other level is the temperature at the emission altitude plus the lapse rate times the difference in heights. Hence, the temperature at the surface differs by the lapse rate times the average height of emissions to space. It’s interesting to consider what would happen if you had a strongly absorbing greenhouse material but a zero lapse rate. You’d get lots of backradiation, but no greenhouse warming. By marvelous happenstance we do have such a physical situation in the oceans. Water absorbs all thermal radiation within about 20 microns, making it something like 20,000 times more powerful a greenhouse material than the atmosphere. It’s a (relatively) easy calculation to show that if radiation was the only way heat could be transported, as the backradiation argument assumes, the temperature a metre down would be several thousand degrees! But water is almost incompressible, having a lapse rate of around 0.1 C/km, and so convection nullifies it entirely. Fortunate, eh? . . .
“The direction of net energy flow is determined only by the difference in temperatures, not the amount of stuff. If you have a big body at a cold temperature next to a small body at a very hot temperature, the cold body might be emitting more heat overall because of its bigger surface area, but the net flow is still from the hot body to the cold. Most of the heat emitted from the big cold body doesn’t hit the small body, because it’s so small. Only the temperature matters. The way this is arranged varies depending on the configuration, but it always happens. People have had a lot of fun over the years trying to construct exotic arrangements of mirrors and radiators and insulators and heat engines to try to break the rule, but nobody has succeeded yet. The second law of thermodynamics is one on the most thoroughly challenged and tested of all the laws of physics. I do encourage people to try though. The prize on offer is a perpetual motion machine to the lucky winner who defeats it! David, I am not a fan of thought experiments about hypothetical worlds with or without CO2. I have read too many threads that go around in circles until everyone turns into wheels. “It is peculiar that everyone is so taken in by the whole notion of the so-called ’radiative greenhouse effect’ being such an ingrained necessity, such a self-evident, requisite part, as it were, of our atmosphere’s inner workings. The ’truth’ and the ’reality’ of the effect is completely taken for granted, a priori. And yet, the actual effect is still only a theoretical construct. In fact, when looking at the real Earth system, it’s quite evident that this effect is not what’s setting the surface temperature of our planet. The whole thing can be stated in a simple, yet accurate manner. The Earth, a rocky sphere at a distance from the Sun of ~149.6 million kilometers, where the Solar irradiance comes in at 1361.7 W/m2, with a mean global albedo, mostly from clouds, of 0.3 and with an atmosphere surrounding it containing a gaseous mass held in place by the planet’s gravity, producing a surface pressure of ~1013 mb, with an ocean of H2O covering 71% of its surface and with a rotation time around its own axis of ~24h, boasts an average global surface temperature of +15°C (288K). Why this specific temperature? Because, with an atmosphere weighing down upon us with the particular pressure that ours exerts, this is the temperature level the surface has to reach and stay at for the global convectional engine to be able to pull enough heat away fast enough from it to be able to balance the particular averaged out energy input from the Sun that we experience. David, an additional point of some importance: There is empirical support for the lapse rate existing independent of IR activity. Global warmists share an assumption that CO2 raises the effective radiating altitude, thereby warming the troposphere and the surface. Now this notion can be found in textbooks and indeed operates in all the climate models. Yet there is no empirical evidence supporting it. 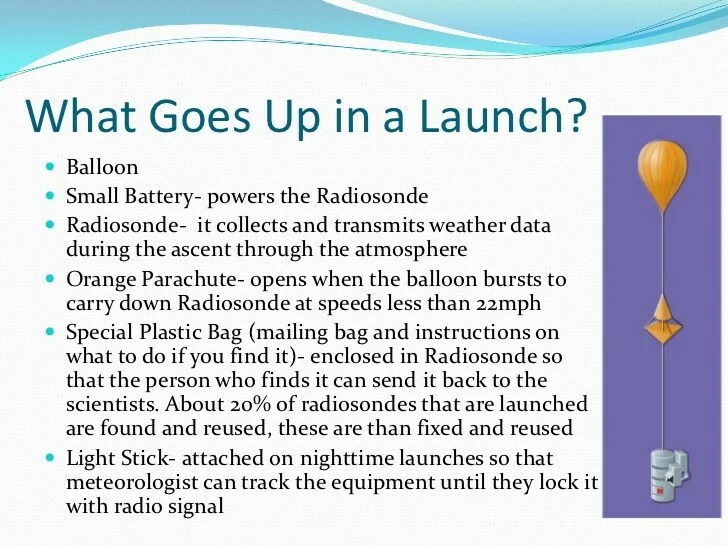 What data there is (radiosonde balloon readings) detects no effect from IR active gases upon the temperature profile in the atmosphere. “It can be seen from the infra-red cooling model of Figure 19 that the greenhouse effect theory predicts a strong influence from the greenhouse gases on the barometric temperature profile. Moreover, the modeled net effect of the greenhouse gases on infra-red cooling varies substantially over the entire atmospheric profile. While water vapour is a greenhouse gas, the effects of water vapour on the temperature profile did not appear to be related to its radiative properties, but rather its different molecular structure and the latent heat released/gained by water in its gas/liquid/solid phase changes. In summary David, it is observed and accepted by all that there is a ~33C difference between the temperature at the surface and at the effective radiating level (the tropopause, where convection stops). Warmists attribute that increase in temperature to the IR activity of CO2. Others, including me, contend that it is the mass of the atmosphere, mostly O2 and N2 delaying the loss of heat from the surface until IR active gases are able to cool the planet effectively without obstruction. That retention of heat in the atmosphere is measurable in the lapse rate. And 90% of the IR activity is due to H2O, especially in the lower troposphere. I was quite taken with comments by David A. on my water wheel post, and am posting the discussion here in case others are interested. Note: This is not a climateball playing field, so ideas and facts are welcome, but not disparaging remarks. Comments containing the latter will be deleted. In ALL cases not involving disparate solar insolation changes, the residence time of the energy must be understood in order to quantify the warming or cooling degree. For instance, clouds are capable of both increasing the residence time of some LWIR radiation from the surface, and decreasing the residence time of SW insolation from the Sun. The net affect is dependent on both the amount of energy affected, and the residence time of the energy affected, which is dependent on both the WL of the energy, and the materials said energy encounters. Now let us say the ten cars instantly slow to a ten hour travel time. Over a ten hour period, the energy budget will increase from ten cars, to 100 cars, with no change of input. Let us say we move to a one hundred hour travel time. Then there will be, over a one hundred hour time period, an increase of 990 cars. Of course the real earth has thousands of lanes traveling at different speeds, and via conduction, convection, radiation, evaporation, condensing, albedo changes, GHGs, etc, etc, trillions of cars constantly changing lanes, with some on the highway for fractions of a second, and some for centuries. Also The sun changes WL over its polarity cycles far more then it changes total TSI. Additionally the sun can apparently enter phases of more active, or less active cycles which last for many decades. Some factors increase residence time in the atmosphere (GHG) but may reduce energy entering a long term residence like the oceans. For Instance, W/V clear sky conditions, greatly reduces surface insolation at disparate W/L. Such thoughts caused me to question the disparate contributions to earth’s total energy budget of SWR verses LWIR. Such thought are cause for me to question the total amount of geothermal heat within the oceans, as many of these cars are on a very slow, century’s long lane. It is true that 100 watts per sq. M of SWR, has the same energy as 100 watts per sq. M of LWIR, however their affect on earth’s energy balance can be dramatically different. In this sense, not all watts are equal. For instance lets us say 100 watts of LWIR back radiation strikes the ocean surface. That energy then accelerates evaporation where said energy is lifted to altitude, and then condenses, liberating some of that energy to radiate to space. Now lets us assume the same 100 watts per sq M strikes the ocean, but this time it is composed of SWR, penetrating up to 800 ‘ deep. Some of that energy may stay with in the ocean for 800 years. The SWR has far more long term energy, and even warming potential then the LWIR. Now, let us say the sun enters a multi-decadal increased active phase, and the SWR W/L which deeply penetrates the ocean surface is .1 Watt per sq meter higher then previously. his .01 watt increase, due to the very long residence time, now accumulates in the ocean for the entire multi decadal solar increase. The oceans are a three dimensional SW selective surface, and should never be treated like a simple blackbody. David, thanks a lot for your comment. I take it that your traffic analogy refers to the flow of energy from the surface through the atmosphere to space. And in that case, the sun is like an assembly plant where cars are rolling into our system at a (mostly) constant rate. When the traffic jams, the additional cars continue to fill the road because they are impeded from turning off into space. An interesting point is the role of the oceans as a kind of parking lot with a variable release of cars onto the road, and thus acts as a buffer between the factory and the traffic flow. I want to think next about the mechanisms at the interface between oceans and air. Thank you Ron. To clarify, The highway is the earth’s system, defined as the “oceans, land, and atmosphere”, the on ramp is Total Solar Insolation, and the off ramp is radiation to space. So in this context albedo radiation is a Lamborghini, and the ocean is gridlock (or parking lot as you said) on the highway. Yes, the ocean is the dog, and the atmosphere is the tail, and a snubbed one at that. A practical example is seen annually. in the SH summer, the earth receives about 7 percent more insolation, (a massive increase in input, close to 90 watts per sq. meter.) yet the atmosphere cools! Is the earth gaining or losing energy in the SH summer? There is certainly reduced residence time in the NH, due to increased albedo of snow on the land mass heavy N.H, and increased residence time in the SH, due to amplified SW ocean penetration. Both factors however remove energy from the atmosphere; the NH through reflecting energy to space, and the SH via absorbing the energy into the oceans, away from the atmosphere for much longer periods. 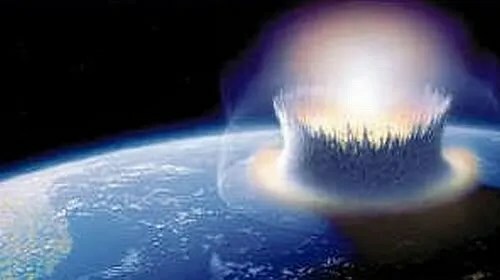 So, despite a massive increase in insolation, the atmosphere cools, but does the earth gain or lose energy? I am guessing that it gains energy, unless SH cloud cover greatly expands, but I have never seen this quantified. All non-input change theories on climate are a manifestation of the affect of “residence time.” I have found this useful in talking to “Slayers” I tell them the GHE is based on increasing the residence time of certain WL of LWIR energy via redirecting exiting LWIR energy back into the system, while input remains constant, thus more total energy is within the system. The greater the increase in residence time of the energy, the greater the potential energy accumulation. In “slayers” defense I will say that some of the energy in the atmosphere is the result of conduction, and if conducted energy manifesting as heat strikes a GHG molecule, and is causative to that GHG molecule sending that energy to space, then said GHG molecule is cooling, as otherwise the conducted energy would have stayed within the atmosphere if it had simply conducted to another non GHG molecule. I have been unsuccessful in getting anyone to quantify how often this happens. In the lower atmosphere collision, or conduction transfers dominate and GHG molecule function pretty much the same as non GHG molecules, transferring energy via collision more rapidly then via radiation. Regarding LWIRs ability to heat the ocean, I am often struck by how black and white the argument usually goes; as in…”LWIR cannot warm the oceans”. The counter argument goes, “can to”. I watched a very long post at WUWT go on and on like that. I tried once or twice to say wait a minute guys, let quantify this, or admit we don’t know. 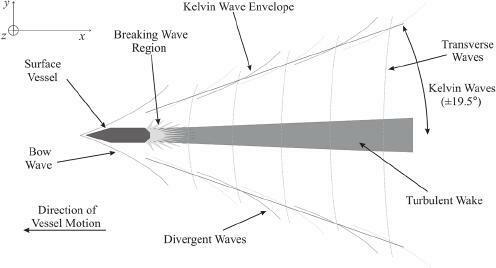 In general I think most of the energy of LWIR goes into evaporation, convection, and energy release through condensing at altitude, and radiation lost to space. However I can see the potential for the surface in some areas to warm, and slow the release of ocean heat. But if the state of our climate science is such that we do not know the answer to this in detail, then this alone, ignoring a dozen other major unknowns, is, IMV, adequate to completely discount the models. David, I am stimulated by this discussion and am posting it separately for others’ interest. 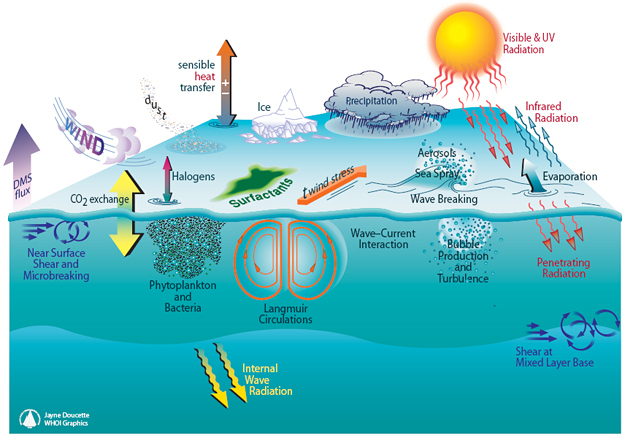 Your point about SH summer provides observational confirmation of the effects of thermal storage in the oceans. Previously I have thought about your points in terms of the delay in heat transport from surface to space. Surrounded by the nearly absolute cold of space, our planet’s heat must move in that direction, which involves pushing it through the atmosphere. Of course, you are right that there is an additional delay within the oceans from the overturning required to bring energy to the surface for cooling. 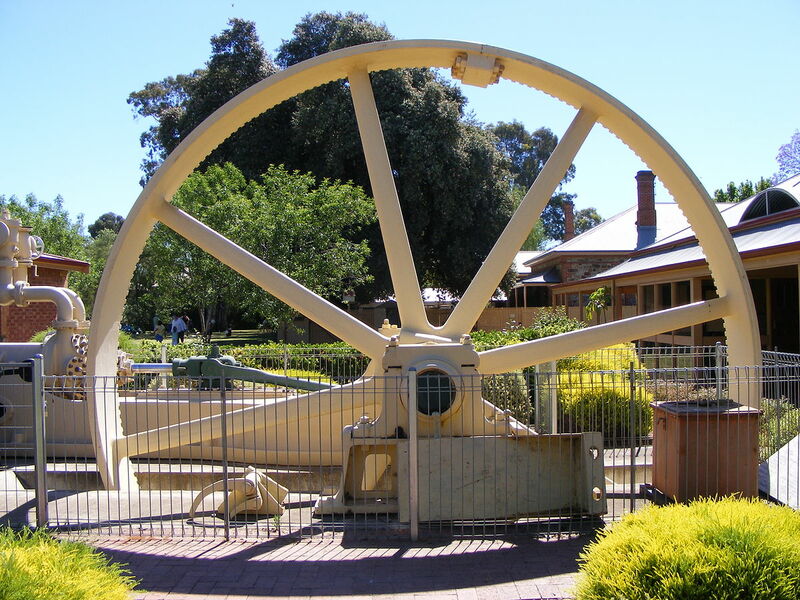 I like the image above depicting the water wheel as a massive traffic circle. There are 3 ways that heat (Infra-Red or IR radiation) passes from the surface to space. 2) Some radiation is absorbed and re-emitted by IR active gases up to the tropopause. Calculations of the free mean path for CO2 show that energy passes from surface to tropopause in less than 5 milliseconds. This is almost speed of light, so delay is negligible. This third pathway has a significant delay of cooling, and is the reason for our mild surface temperature, averaging about 15C. Yes, earth’s atmosphere produces a buildup of heat at the surface. The bulk gases, O2 and N2, trap heat near the surface, while IR-active gases, mainly H20 and CO2, provide the radiative cooling at the top of the atmosphere. Updates 1 and 2 at bottom. I was intrigued by the wheel in the diagram, but also puzzled about the numbers. 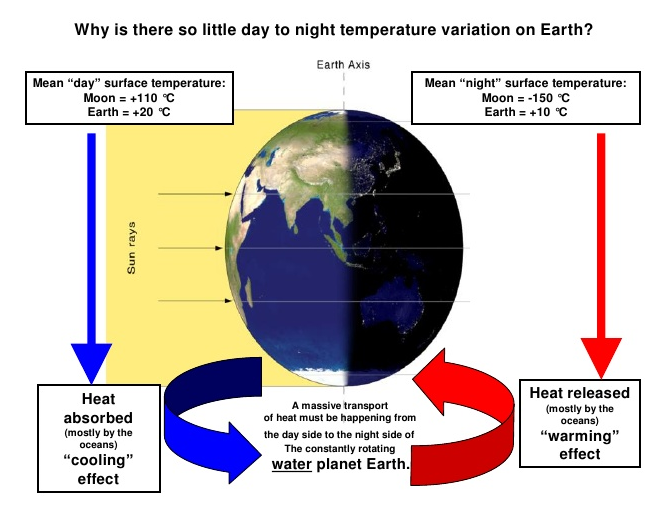 In comparison to the moon, the earth’s temperature decrease is small, but still the image shows overnight cooling on average from 20C to 10C, in contradiction to the Illis comment above. You see? Illis is talking about the accumulation of heat, and the diagram shows surface temperatures, “surface” being the key word. In infrared remote sensing methodology the radiation emanates from the top “skin” of the ocean, approximately the top 0.01 mm or less. A 6C change there is nothing compared to the massive thermal capacity underneath. After all, the top 2 meters of the ocean match the entire heat in the overlaying atmosphere. And land surface temperatures aren’t measuring the surface, but rather the air 1 meter up. Sure the soil cools off at night, but go down even a few centimeters, and the warmth remains. People would not have built and lived in underground villages in places like Cappadocia if the land gave up its heat so readily. 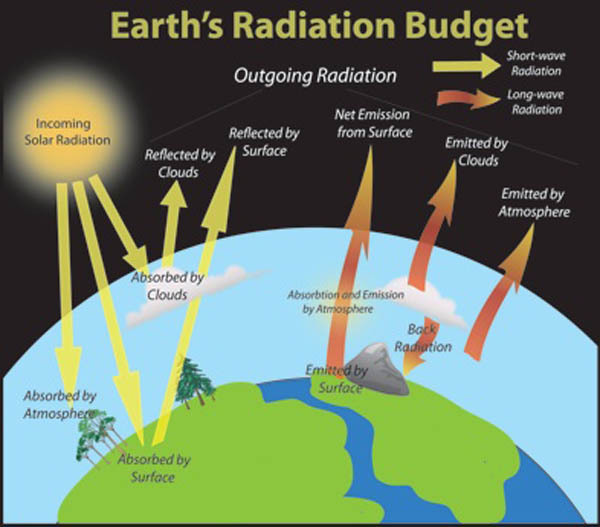 Climate science has been obsessed with only a part of the system, namely the atmosphere and radiation, in order to focus attention on the non-condensing IR active gases. 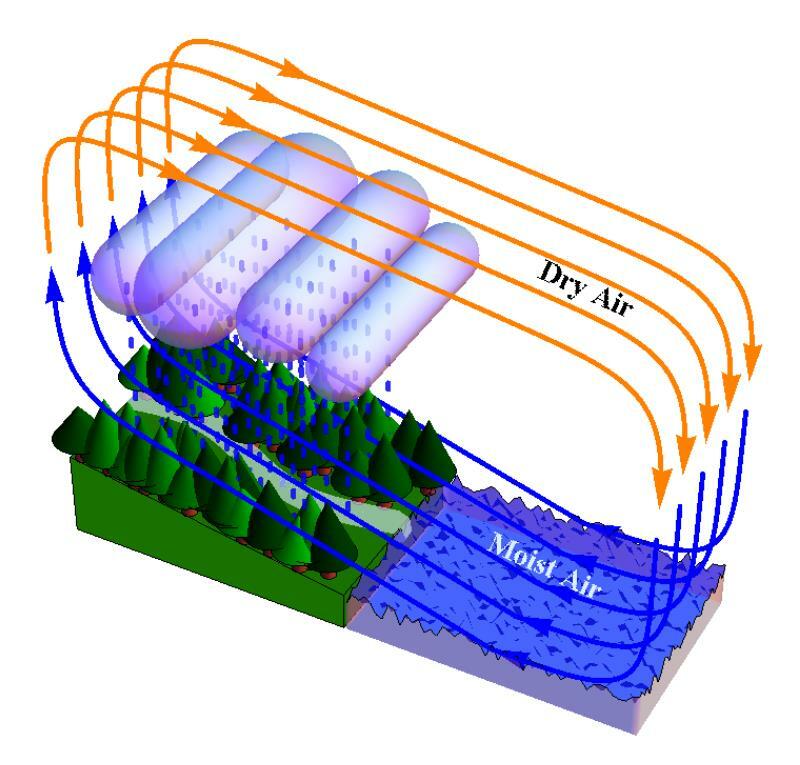 The climate is framed as a 3D atmosphere above a 2D surface. That narrow scope leaves out the powerful non-radiative heat transfer mechanisms that dominate the lower troposphere, and the vast reservoir of thermal energy deep in the oceans. In 1991, when the IUGG and its associations met in Vienna for their General Assembly, the presidents and the secretaries-general of the four associations I’ve mentioned, discussed the program we would propose to forward to the International Commission of Scientific Unions (ICSU) for consideration at the 1992 Rio de Janeiro Conference. We all decided not to prepare any programs! Furthermore, we stated, “climate modeling has been concentrated on the atmosphere with only a primitive representation of the ocean.” Actually, some of the early models depict the oceans as nearly stagnant. 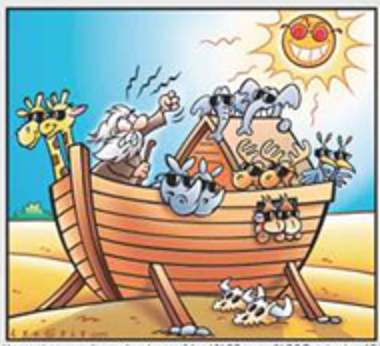 The logical approach would have been to model the oceans first (there were some reasonable ocean models at the time), then adding the atmospheric factors. In the real world, radiative heat loss is determined by the temperature differential, fixed at the top of the atmosphere by the vacuum of space, and maintained at the bottom of the atmosphere by the oceans. The surface temperatures are noisy because the water is always in motion, made chaotic by flowing over and around irregular land masses. But the oceans’ bulk keeps the temperature within a remarkably tight range over the millennia. 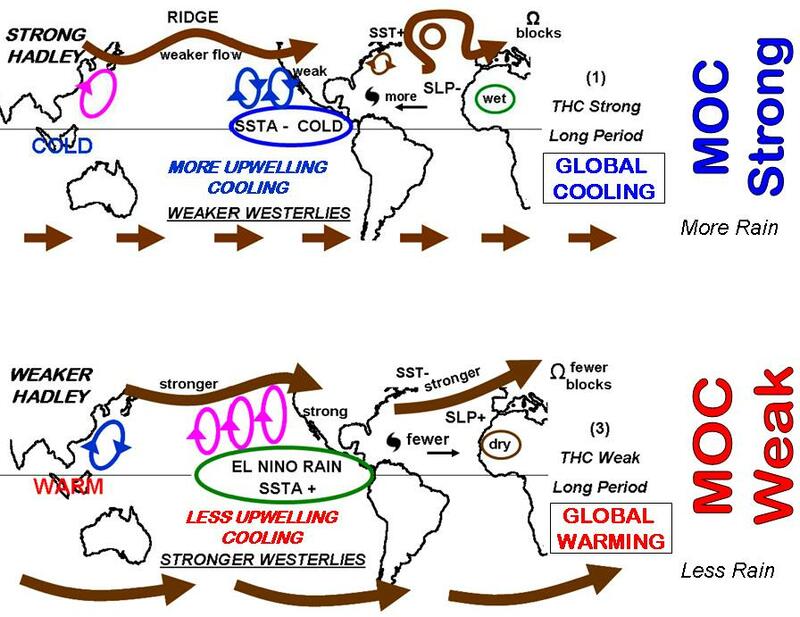 More recently, the computer-driven models are coupled with ocean models, but often these are appendages, added on trying to improve the performance of atmospheric circulation. One of the features of these models is the setting used for the oceans’ “inertia”, which affects how slowly the artificial system responds to changes. The flywheel is a better metaphor since the oceans are always in motion while stabilizing temperatures and climate. It turns out that not only do the oceans maintain the mild habitat to which we are adapted, they also leave a climate record on the ocean floor. 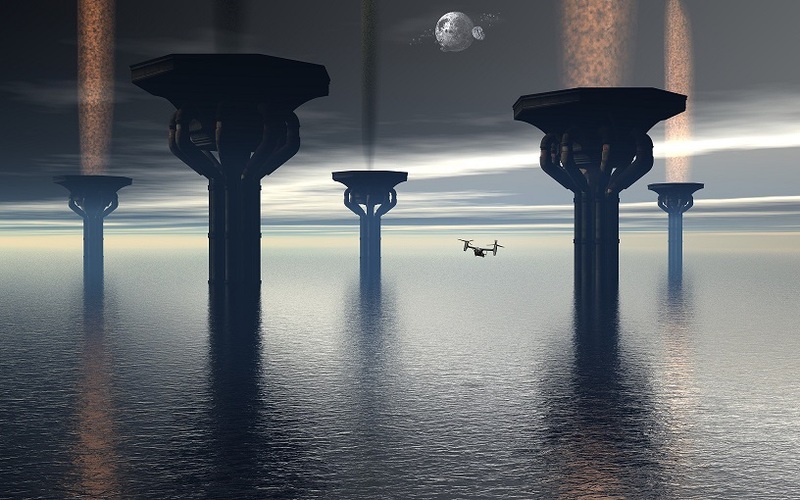 On longer time scales, the ocean flywheel is overwhelmed by orbital changes to the incoming solar energy, triggering regime shifts between the “Hot House” and the “Ice House”. Between shifts, the flywheel maintains the new steady state. “There are also d18O isotopes which have proven to be very reliable proxies for temperature in the distant past. There are even International Standards for how to use these proxies to estimate temperature. Search Vienna Standard Mean Ocean Water if you want to know more about this. 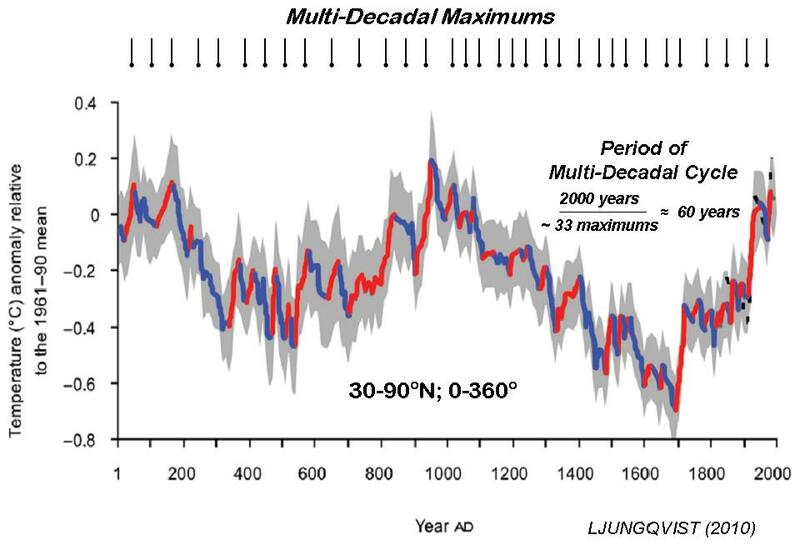 The climate history charts in the article at the main post are based on this proxy of course. There are d18O isotopes which have been dated going back all the way to 2.6 billion years ago. In total, there are 40,000 dated dO18 proxies covering the periods back to this time. 40,000 reliable proxies is more than enough to make a call about this history. (1) The oceans transport heat around the globe via massive currents which sweep grandly through the various ocean basins. As a result, the tropics are cooler than they would be otherwise, and the lands of the high latitudes are warmer. The global circulation of heat in the oceans moderates the air temperatures around the whole world. (2) Because of the high density/specific heat of sea water, the entire heat in the overlying atmosphere can be contained in the top two meters of the oceans. This enormous storage capacity enables the oceans to “buffer” any major deviations in temperature, moderating both heat and cold waves alike. 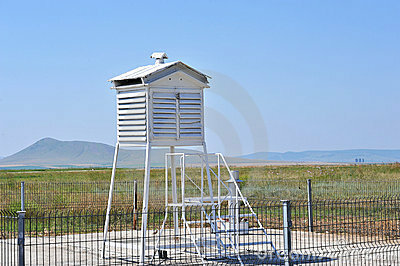 In the real world climate, water in all its phases is the heart of the matter, and atmosphere is ancillary. Since Copernicus we all think of our planetary system with the sun in the center. 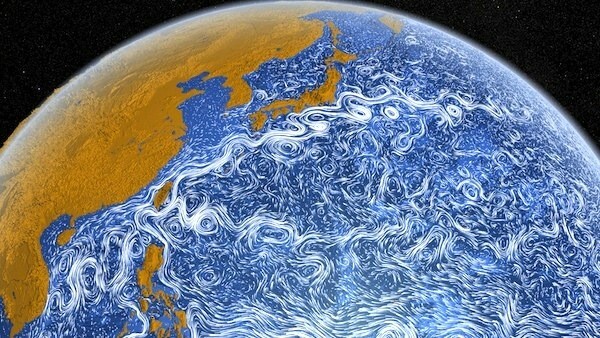 We should be thinking of our climate system with the oceans in the center. Solar forcing of ocean SST . . .Hummmm. The plot thickens. More people are familiar with the above brand of work and casual wear than know of the similarly named sea near the Arctic Circle. 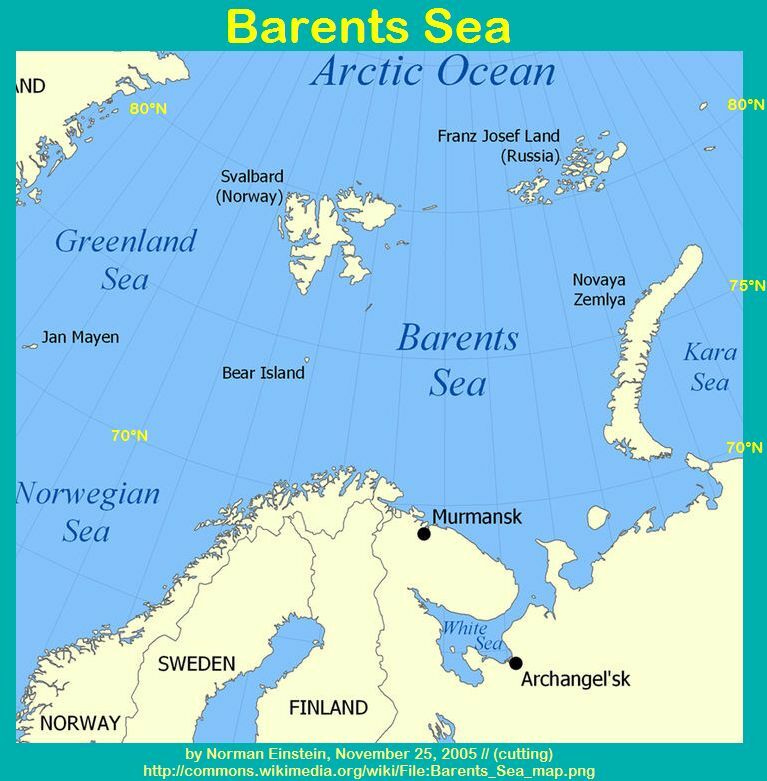 And many confuse the Barents and Bering Seas which are on opposite sides of the Arctic. So what? 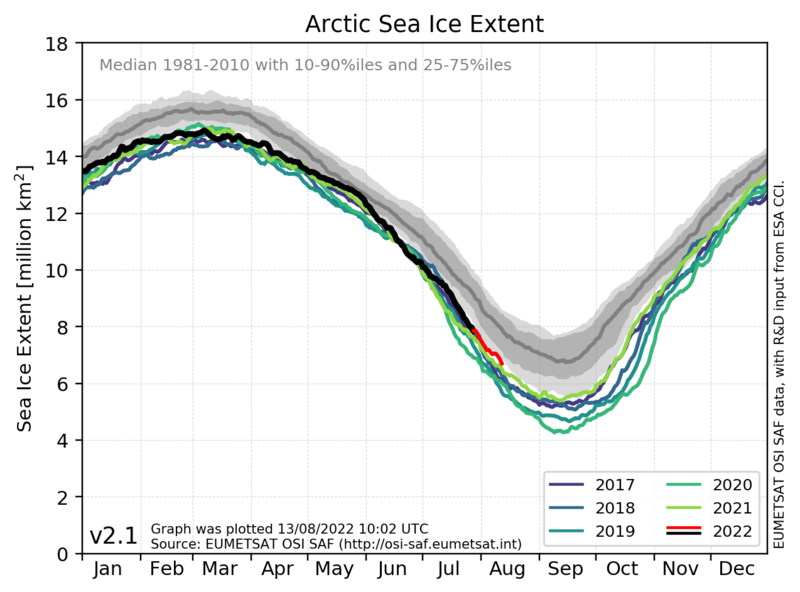 Here’s the thing: This year’s NH sea ice extent (Arctic plus nearby seas) is down. 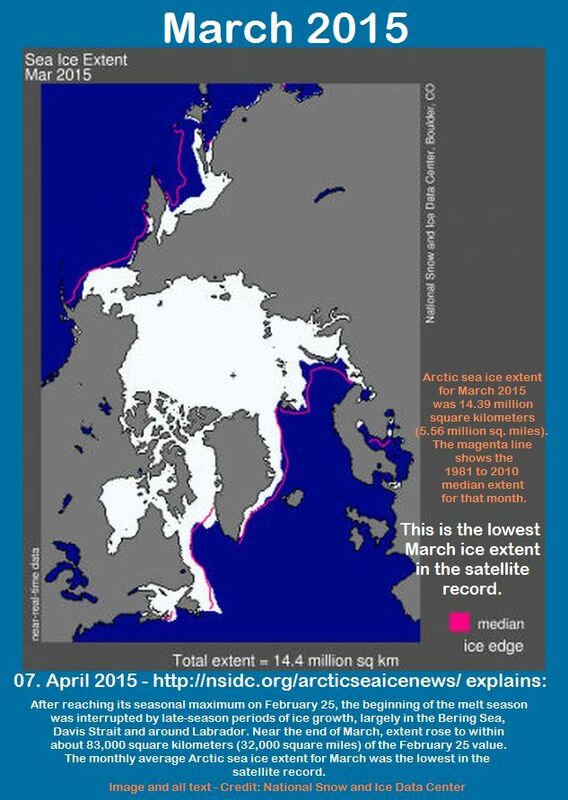 And so we’re getting the warnings about the Arctic “death spiral” and starving polar bears. It turns out that most of the difference between this year and last comes from less ice in Okhotsk and Barents. and human offshore activities not to blame – at least a bit? While the total maximum ice extent in NH is always 14-16 MKm2, both OKhotsk and Barents max extents vary a lot year to year. For example, the Sea of Okhotsk covers 1.58 MKm2 – it’s a huge basin that was virtually filled with ice in March 1979 but only about 1/3 filled in 2015. Both seas cover about the same area (1,5 Mio. km²), the Sea of Okhotsk with an average depth of 859 m, and the Barents Sea only 230 m, but differ grossly in many other aspects. While the latter is a continental Shelf, with three islands (Spitsbergen, Franz Josef Land and Novaya Zemlya) as boundaries and open to the North Atlantic and Arctic Ocean, the Sea of Okhotsk is semi enclosed, with an internal current system (Fig. 8-9). 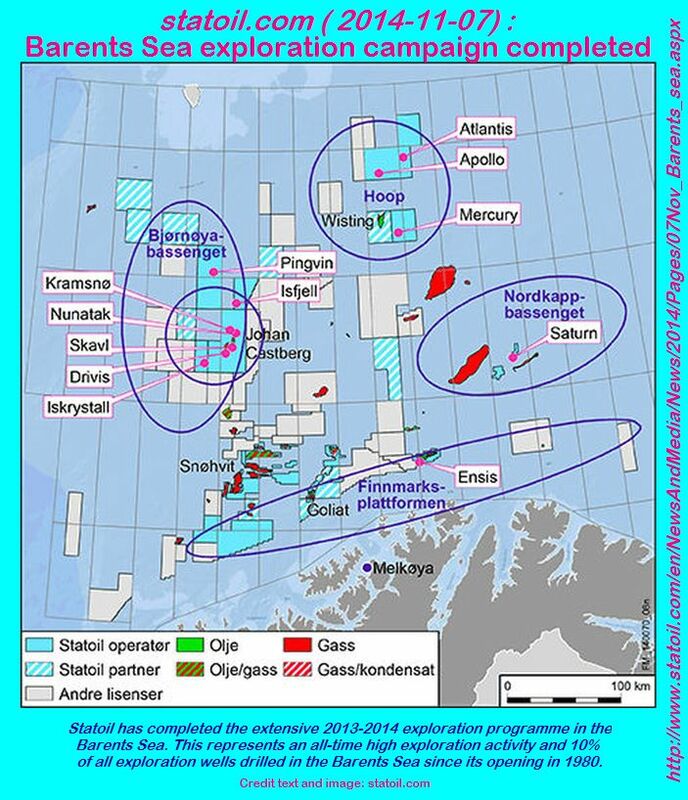 Okhotsk will lose all its ice by July, and Barents usually retains less than 20%. Bernaerts’ larger point is that in addition to natural variations in circulations, winds and clouds, human activity is also changing the climate, and particularly the ice extent in these places. Both have extensive fishing and commercial shipping, ice-breakers operating, submarine fleet exercises, sea bottom oil extraction, etc. All of these have an effect in the direction of inhibiting ice formation. Oh, and about the polar bears: They have never been at Okhotsk and never will be. As for Barents, the ice conditions are providing suitable hunting conditions for the polar bears (perhaps the seals deserve a warning). After the early arrival at maximum in February, NH ice extent went sideways and is now on the track of recent years. Where it goes from here is always entertaining. Alas, on closer inspection, my dreams of California greenbacks flowing here to Montreal were just an illusion. It’s actually Quebec who will be going to the cleaners. Perhaps I was caught up in irrational exuberance. There has also been a feeling in Québec that the province would make money with cap-and-trade—“that Québec has a lot to sell”. 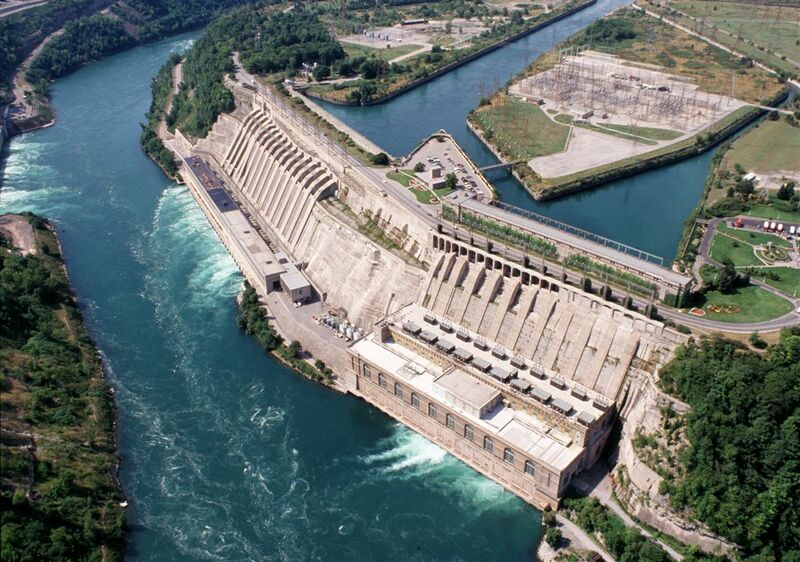 Québec should also have an advantage as one of the least carbon intensive jurisdictions in North America, with zero-carbon hydro-electric power. Well, that makes sense, but it’s not how it works. There’s Two Sides to the Story. Depending on the price of carbon, it could even get worse for Quebec drivers. 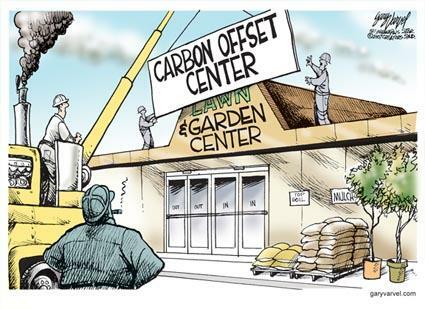 Carbon currently costs $11.39 per tonne. Drivers will pay two and a half cents more per litre if this goes up to $15, six cents more for $30 per tonne, and a dime more for $50. Quebecers already pay the most tax on gas in North America. Since the beginning of the year, they have paid on average over 50 cents in taxes for each litre they buy. Amazingly, since gasoline retailers jerk the pump prices up and down each week by at least 10 cents/liter, most drivers don’t notice these tax increases. What’s in the Trading Deal? California gets a revenue transfer and Quebec gets a discounted price on its action plan. But maybe more importantly, both get a bump in their cash flows. Proceeds from selling allowances are expected to increase the revenues of the Quebec government by $500 million for 2015 alone. By 2020, it represents an expected $3.5 billion of extra income. My view on this deal is tainted by my not accepting the premise that CO2 is a pollutant rather than essential to life in the biosphere. Thus carbon reduction targets are not only arbitrary, but unnecessary, unless you believe catastrophe is coming and you don’t want to be blamed for it. You’d think there would be a cautionary tale in this for others, but Ontario has committed and those two provinces make up 56% of Canadian GDP. Oh, and Quebec’s reward for low carbon intensity? Just like reducing weight is more difficult when you are already skinny, so Quebec will have to pay more to achieve its targets. Couldn’t we just rest upon our low carbon laurels until the others catch up? And by the way, this month Hydroquebec customers got a 4.3% rate increase. The renewables lobby says not to blame it on their feed-in tariffs. Unfortunately, climate science is rife with this. A research announcement is released and the same text appears in media articles everywhere, the only difference being who can attach the scariest headline. One list of things claimed to be caused by global warming numbers 883, including many head scratchers. Lawrence Lab Report: Proof of Global Warming? But the IPCC Assessment Reports display the worst abuse of headline claims denied by statements in the details. The headlines are in the Summary for Policy Makers (SPM) while scientists write the details in the Working Group reports, in particular WGII. We see again a familiar pattern in the latest AR5 round of IPCC releases. As previously, the SPM features alarming statements, which are then second-guessed (undermined) by the actual science imbedded in the report details. For example, I looked at the topic of ocean acidification and fish productivity. The SPM asserts on Page 17 that fish habitats and production will fall and that ocean acidification threatens marine ecosystems. Many know of the Latin phrase “caveat emptor,” meaning “Let the buyer beware”. When it comes to climate science, remember also “caveat lector”–”Let the reader beware”. We hear a lot about CO2 as climate’s “control knob, but about the oceans’ pacemaker, AMOC? Not so much. In the Water World post, I referenced the match between SSTs (sea surface temperatures) as recorded in HadISSAT and the IPO, an index of SSTs in the Eastern Pacific: North, Central and South. This is a brief discussion of the Atlantic role in shaping climate patterns, especially in Europe and North America. Now the focus is on the Atlantic SSTs and what to expect from the AMO (Atlantic Multidecadal Oscillation), which has peaked and is likely to trend downward. In the background is a large scale actor, the Atlantic Meridional Overturning Circulation (AMOC) which is the Atlantic part of the global “conveyor belt” moving warm water from the equatorial oceans to the poles and back again. The notion of the AMOC as the climate pacemaker derives from its role in conveying Pacific shifts into the Atlantic. 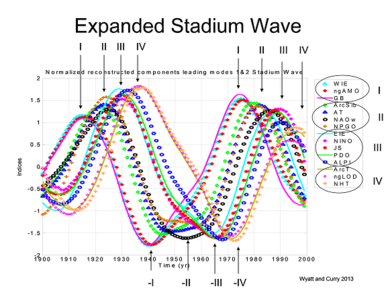 The critical role of the AMOC and the Atlantic’s global influence is described as part of a “stadium wave” by which the effects ripple throughout all the ocean oscillations. What is the AMOC up to these days? Are we on the cusp of oceanic climate change? Following Dr. Bernaerts’ discussion that Oceans Make Climate, and that naval activity has an effect, this post overviews issues concerning the heat flux at the boundary between sea surface and atmosphere. As mentioned above, this flux is not in equilibrium or steady state, but constantly subject to turbulence, both natural and man-made. Therein lies the difficulty in measuring it accurately and documenting changes over time. The study above, while not addressing ships, shows that latent heat varies considerably with turbulence. Schematic of a typical turbulent ship wake as viewed by SAR. The incoming solar energy is reduced by the “bright water” resulting from air bubbles and foam in the wake. However authors of this study do not estimate albedo effect from shipping to be significant at this time. 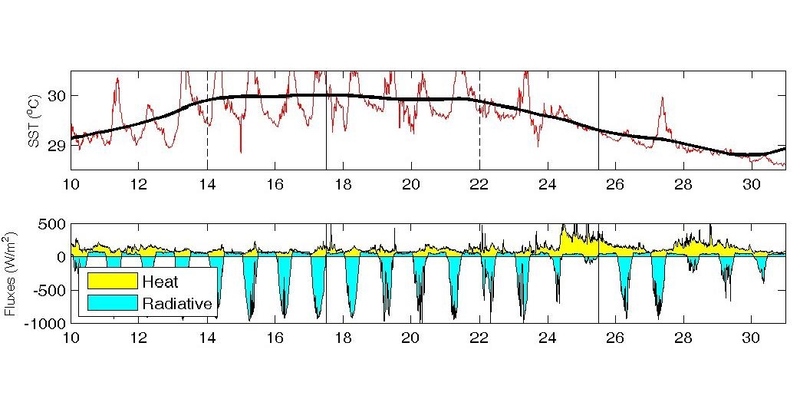 There are some efforts to measure the infrared signature of ship wakes, including emitted energy. Ocean turbulence is being studied but not as extensively as atmospheric turbulence. In both domains, drawing climate conclusions is challenging. There is an albedo effect of a ship’s wake that reflects solar SW, but one study considers it a small effect. The release of latent heat varies significantly with wind changes, but the effect from shipping is not known. Other ocean effects from shipping are not discussed here, such as additional release of CO2 and ice-breaking in the Arctic .